A frozen block resembling an ice cube. Ice Blocks are frozen versions of regular blocks in various Mario games. Ice Blocks appear in World 4 of Super Mario Bros. 2. They act as slippery platforms. If the character jumps below one, he or she will pass through it, an ability that did not appear in later games. In Super Mario Bros. 3, several types of Ice Blocks appear. Throwable Ice Blocks look like white (blue in remakes) Brick Blocks. If a Buster Beetle gets its hands one of these blocks, it will throw it at high speeds towards Mario or Luigi. If the player picks one up, they can only hold it for a short time before it disappears. When thrown, it can defeat multiple enemies, like a Koopa Shell, though it breaks upon hitting a wall. Another rarer Ice Block also exists; it is transparent and can be melted by fireballs from Mario/Luigi's Fire form. Some contain coins, while others contain Munchers. Lastly, there are Ice Blocks that are just slippery platforms; these Ice Blocks can be normal (the size of a Brick Block) or giant-sized (two times bigger, like Big Blocks). All types of Ice Blocks appear mostly in Ice Land. A few Ice Blocks make a small appearance in the level Awesome of the Special Zone. In this game, none can be picked up, because they all are slippery platforms. They appear as light blue Rotating Blocks. The grabbing function of the Ice Blocks from Super Mario Bros. 3 is incorporated into Grab Blocks. In Super Mario Sunshine, Ice Blocks appear in special stages and Delfino Airstrip as transparent blocks emanating an icy mist. They can be melted with F.L.U.D.D.. In Super Mario 64 DS, they appear in ice-themed levels such as Cool, Cool Mountain and Snowman's Land. They can only be melted with Yoshi's fire breath. In New Super Mario Bros., they are once again slippery platforms. They are found in World 5. In New Super Mario Bros. Wii, there are five types of Ice Blocks: ice blocks that consist of enemies frozen by an Ice Flower or other ice projectile, ice blocks that can be picked up and thrown at enemies in World 3-4 and World 3-5, similarly to Grab Blocks (they can't hurt players, unlike Barrels), frozen-over Snake Blocks called Ice Snake Blocks that only appear in World 3- , giant ice blocks (in the same level mentioned) that can only be destroyed using Bob-ombs, and ice blocks that only appear in World 9-7, which, as in Super Mario Bros. 3, can contain Coins and Munchers and can be melted with fireballs from a Fire Flower or enemy. In New Super Mario Bros. 2, Ice Blocks are found in World 4. Once again they cause Mario or Luigi to skid. Ice Blocks also appear in New Super Mario Bros. U. They once again act as platforms, but some can also act as an obstacle to the player because the Fire Piranha Plants cause them to fall, and can instantly squish Mario, killing him in one hit. These blocks are only in the level Piranha Plants on Ice. Ice Blocks appear in Super Mario Maker, Super Mario Maker for Nintendo 3DS and Super Mario Maker 2, although they only appear as slippery platforms in all four level styles and therefore cannot be picked up. They also cannot be melted with fire. They are given new sprites for the Super Mario Bros. and Super Mario World styles. In Super Mario World 2: Yoshi's Island, they serve as slippery obstacles that cannot be picked up, but can be melted by Yoshi's fire breath after eating a red watermelon, Lava Bubble, or Pyro Guy. Some Ice Blocks hide items. In this game, the blocks simply look like a block of ice. 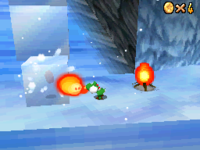 In Yoshi's Island DS, they retain their role from the original Yoshi's Island; however, they can only be melted by Baby Bowser and Scorchits, although the latter can melt some Baby Bowser can't. Ice Blocks return in Yoshi's Woolly World and its remake, appearing in the levels Fluffy Snow, Here We Go! and Frozen Solid and Chilled. Like in previous games, they will melt from the effects of fire from a Fire Watermelon. Ice Blocks from the Super Mario World style of Super Mario Maker appear as collectible badges in Nintendo Badge Arcade. ↑ Hodgson, David S J, Bryan Stratton, and Stephen Stratton. Super Mario Sunshine Prima Official Strategy Guide. Page 14. ↑ Shogakukan. 2015. Super Mario Bros. Hyakka: Nintendo Kōshiki Guidebook, Super Mario Bros. 3 section, page 40. 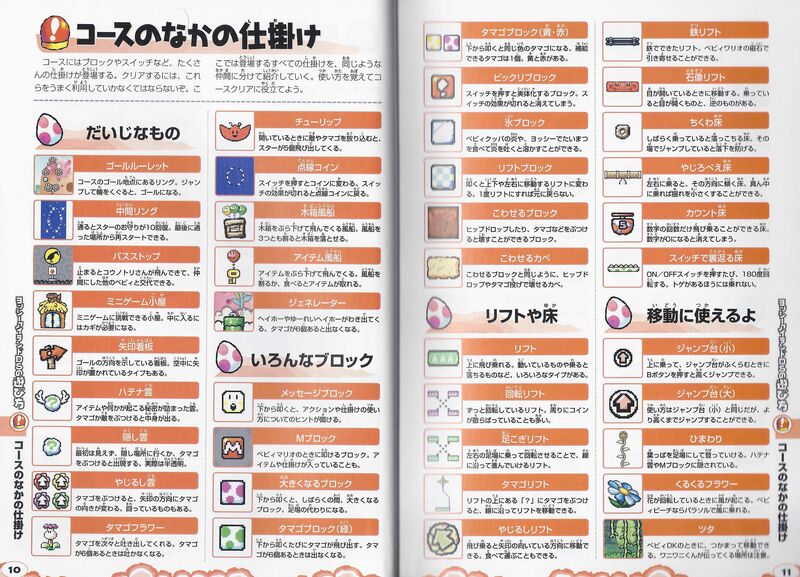 ↑ Yoshi's Island DS Nintendo Dream Book, page 11.